LUMUHAND: To overcome or not overcome fear - That is the question. To overcome or not overcome fear - That is the question. When I first moved to Paducah in January 2010, what started out as a "one-time thing" to cross off #10 on a bucket list, has turned out to be so much more. I remember how nervous I was to audition for a production with Market House Theater. I had no prior theater experience and didn't know the first thing about auditioning, or even how to act for that matter. I wanted to step outside my comfort zone and do something that I'd never done before, partially to prove to myself that I could do it, but to also put myself out there in hopes that I would make some friends. You see, I moved to Paducah from the suburbs of Louisville (Go CARDS!) to 'start-over' after a devastating break-up (I'm sure this will be a post one day). Following the first audition, I was cast in a small role as the jilted fiance in a production called, Getting Sara Married. This role led to me playing another small role, the teacher in A Christmas Story. No doubt, by this point, the theater bug had bitten. I started to become active with the theater's Murder Mystery Troupe, which is essentially a dinner theater where we act out a short script, interact/improv with guests who work together trying to solve the crime, followed by the acting out of the solution scene. Taking on the persona of a character and interacting with guests is SO FUN. 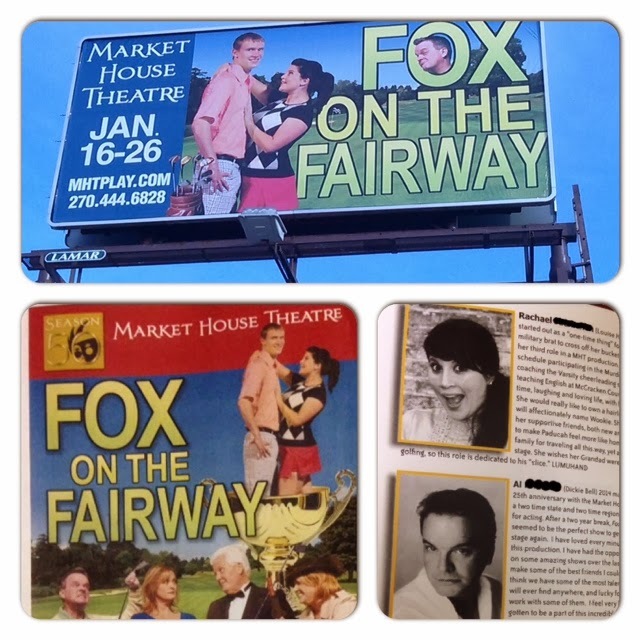 This past week was opening week for a production where I am playing a more substantial role, Louise, in Fox on the Fairway. I'm actually the "Fox" in this golfing comedy and although it has been time consuming, it has been one of the most rewarding experiences. I'm surrounded by actors who have been doing this for 20+ years and the director of the show has been the Executive Director of the theater for a looooong time. He is so talented and I have learned so much from his direction. My cast mates have become my friends, and together we're part of a close-knit Market House family. I have met some of the most amazing people through this venture, (Check out Al in his epic "Days of Our Lives" themed headshot beneath mine in the program) and I've gotten to be on a billboard, although the designer could have hooked me up with a little arm slimmage (The intended hard-core workout/diet regimen never came to fruition) but admittedly, it's still hella cool to be on a billboard. I think Eleanor Roosevelt was on to something when she suggested that you, "Do one thing every day that scares you." Although I tend to play it safe often, auditioning is definitely scary and performing in front of a live audience is even scarier. What fear did you overcome in exchange for a wonderful experience or memory?